Diamonds are a girl’s best friend, and for that said, Silicon Power release a flash drive technology that truly shines like a diamond – Diamond Check USB 3.0, Blaze B30. Featuring the geometric diamond-cut pattern carved on the glossy translucent body, Blaze B30 shines like a luxurious jewelry, and is able to reflect the sparkle through different source of lights. With the built-in LED indicator, the light will illuminate through the outer case, and indicate the data transfer status during use. Different from the commonly seen USB flash drive, Blaze B30 incorporates the 360 degree cap-less swivel design with the stainless metal structure. This allows users to use and store with just a thumb push. B30 also enhances its durability of the swivel axis with the four-way positioning rotating technology which avoids any damages or debris on the USB connector from loose axis and provides up to 5000 times of guarantee usage. Moreover, the upper swivel part is built with unibody metal structure, which allows the total invisibility of the swivel axis and presents a sleeker and edgier look for your storage device. 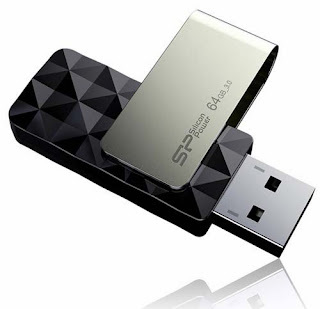 Silicon Power Blaze B30 offers wide range choices of capacity in 8GB, 16GB, 32GB and 64GB. B30 is capable of delivering remarkable performance in multiple data transferring with its USB 3.0 SuperSpeed interface. All Silicon Power USB flash drive products come with a lifetime warranty, SP Widget application software which provides seven major back up and security tools and a 60-day trial version of NIS(Norton Internet Security). Furthermore, SP also provides users with the Recuva File Recovery which allows users to rescue the deleted files at ease. For more information about the product(s), please visit the SP/Silicon Power website (click here). *Disclosure: An important note, we are just sharing this information to the public, provided by our source (Image Media Phils). Silicon Power Info / Logos / Photos / Images has respective copyrights. very elegant looking usb, love it.